In the 16 plus years that I’ve been working as an editor and proofreader, I’ve seen many changes when it comes to working with words. One of them has been the tasks associated with proofreading, and the idea of what proofreaders can and should do for people. 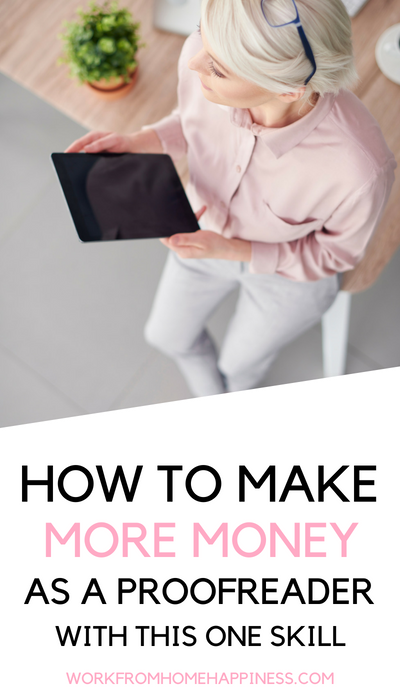 To make more money as a proofreader, and to do it for the long term, you need to make yourself more marketable. And you can do that by learning one particular skill that’ll up your proofreading game. In this post, I draw from my professional experience as an editor to show you how. Proofreading is a surface check for typos. Proofreaders will read text looking for errors in spelling, punctuation, formatting, and basic grammar. They do not go deep into the text, rewrite, reorganize, or make judgement calls on content. Proofreading is also considered the easiest form of editing, and it’s become a popular way for people to work from home. It’s generally low-stress in nature, flexible, requires a short training period, and doesn’t need a lot of equipment. All you need is your computer, an internet connection, and resources. The proofreading industry isn’t regulated by any governing agencies, and you don’t need a special certificate, degree, membership, or accreditation to work as a proofreader. However, you do need to be properly trained in specific mechanical know-how, editorial processes, and knowledge of industry best practices. Without proper training, you will lack the knowledge and experience that’ll allow you to work on various kinds of content. And while many people love the idea of getting paid to read and spot errors, now proofreading has become a lot more than fixing mistakes in text. In my long career as an editor, I’ve proofread many different types of content including books, articles, reports, and blog posts to name some examples. I’ve also worked on over 1600 fiction and nonfiction books for traditional publishers like HarperCollins and Harlequin. I do freelance proofreading for some of these companies, and one thing that I can tell you without a doubt, is that 95% of the books I work on require more than the traditional surface-only proofreading skills. It’s very rare to work on a print book or ebook requiring just a straightforward, surface-only proofread. Times are changing. From my own marketing process, and from teaching on my blog, I can tell you that clients now want proofreaders who can do more. In my time working with publishers and self-published writers, and businesses and entrepreneurs, I’ve learned that people want someone who can do more if necessary. They want proofreaders who can also do light to moderate copyediting skills, also known as “basic” copyediting. So why is it important for you to learn some copyediting skills? Well, it’s so you can recognize and address problematic issues that could negatively impact a brand’s message or an author’s unique voice. It’s so you can go deeper into the text if you have to. Clients want you to really care about their content and to make sure everything is on brand, cohesive, and the best it can be. And they want to know that you can fix it so it is. Light copyediting is sometimes referred to in the publishing world as “high-end proofreading.” Some of you may have even heard proofreading and light copyediting together as “proof-editing.” I prefer to call it “high-level proofreading.” Whatever you call it, it’s clear that you need to learn it. If you invest in learning light copyediting skills in addition to proofreading, you not only up your skill set, but you also make yourself more marketable, you stand out from the crowd of surface-only proofreaders (and there are a lot! ), and my favourite: you can make more money. Knowing copyediting skills can make you eligible for copyediting projects and other higher-level editing jobs depending on the qualifications. You can also command a higher rate. While trained proofreaders can make as high up as $30 – $35/hour, copyeditors who just work within a light to moderate scale can make as high as $40 – $60 an hour, or sometimes even higher. Recently, I worked on a project for a government agency that wanted a copyedit on a report. They didn’t want a heavy copyedit that would’ve involved rearranging and rewriting text. They wanted me to do a copyedit to make sure everything was cohesive, the grammar was correct, etc. Basically, what they wanted was a light copyedit. They asked for a copyeditor, although the majority of the tasks were proofreading. But because there were some light copyediting tasks involved, I was able to quote them my copyeditor’s rate. It was $60 an hour, plus a hefty rush fee since the client wanted it done ASAP. Mind you, I have many years of experience behind me, so I can command this rate, but it’s a rate that is attainable with the right set of skills and knowledge. And if you have experience in a niche like medical, engineering, or software, then you can definitely go in at a high rate. So that’s an example of how, with just some extra training and top-notch skills, you can wear two hats and switch them around if need be. 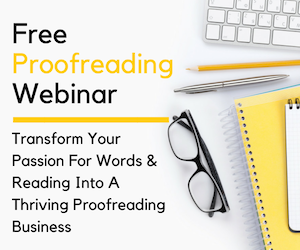 If you want to learn more about gaining proofreading and copyediting skills, then I recommend you sign up for my FREE 45-minute workshop webinar. In it, I discuss all things proofreading, content, publishing, and light copyediting. 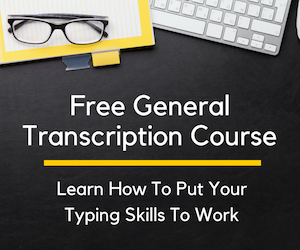 Click here to enroll in the free workshop. I often get emails from people asking me if there really is room for more proofreaders in the world. The answer is yes. Think about all the websites, blogs, books, reports, guides, scripts, and magazines in the world that are created. There are over a billion websites in the digital sphere! Because of the internet and smartphones, people have become voracious consumers of content, which in turn is increasing its creation. And people want quality content. Not messy, unprofessional content. In regards to publishing, ebooks and self-published books have become very popular, and writers are starting to realize that the quality of their books matter if they want readers to become dedicated, raving fans. No one recommends a book that’s shoddy and full of errors. So there’s a need for proofreaders who can clean up, refine, and help their clients come across as authoritative professionals. Not only do clients deserve more, but you do, too. You want to stand out from the crowd. There are a lot of proofreaders out there doing the same thing across many niches. How are you going to stand out? That’s why in my course, High-Level Proofreading Pro, I teach my students not only full-stack proofreading skills, but also light to moderate copyediting. I always tell people that proofreading is like fine wine. It gets better with time. 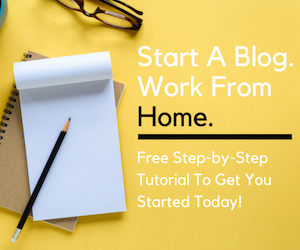 Whether you want to proofread as a full-time freelance career, add on to your services, or want to do it as a side hustle to bring in extra money every month, you want to be able to meet client expectations. You also want to stick around for the long term, and be able to take your abilities further than the average proofreader. Why not go beyond the basics, so you can do more and be more, right? Phon Baillie is a freelance editor, writer, and entrepreneur. She teaches people how to proofread and copyedit at Art of Proofreading, and the Proofreaders' Blog. Fun fact: Phon has proofread over 1,400 romance novels—and counting!